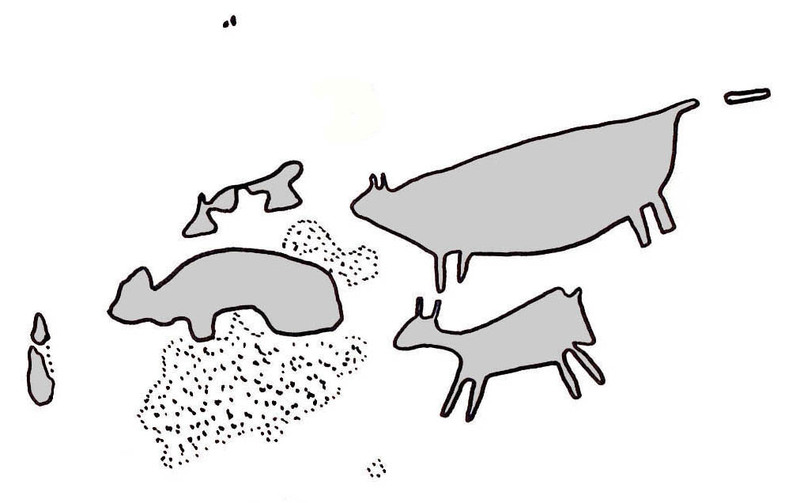 The Turtle Shelter Rock Art Site was described by Carol Diaz-Granados (1993) in her dissertation written at Washington University. 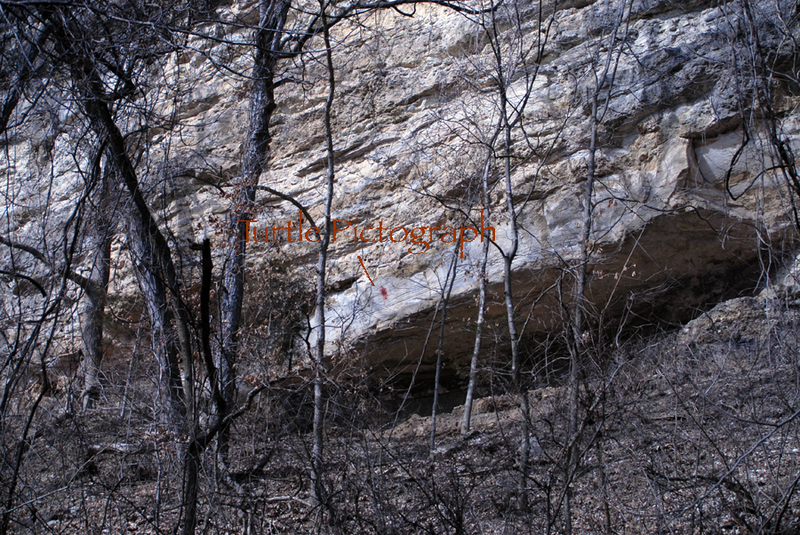 She used a different name for the site and considered the idenficiation of the main petrograph as NOT a turtle; it is not included in her 2000 book on Petroglyphs and Pictographs in Missouri. The site is situated on private property in the Missouri River Valley and it is not open to the public. 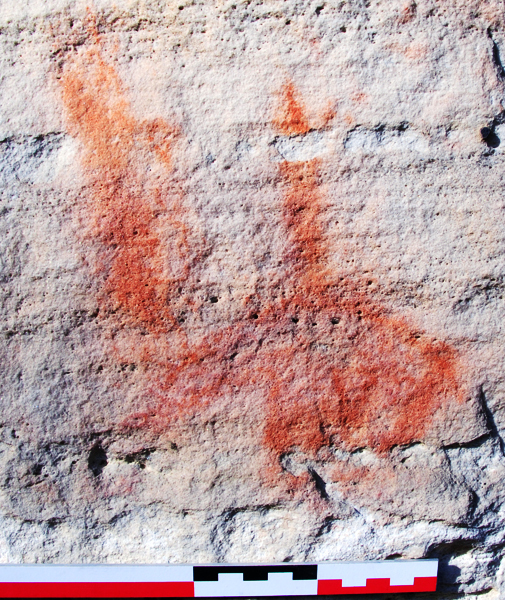 Turtle shelter is named after the prominent pictograph painted over the entrance of a shallow shelter. The amateur archaeologists interpret the pictograph as a turtle. It resembles a turtle with blood draining from its wounded head. Another possibility is that it is a shield. Turtle shelter visible from the foot of the bluff. 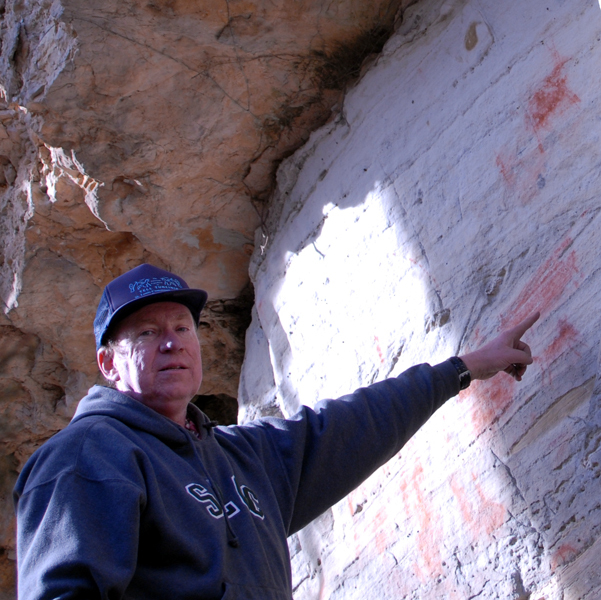 Professor Michael Fuller (St. Louis Community College) points to the pictograph of a bison on the far left panel of the Turtle Shelter Rock Art Site. 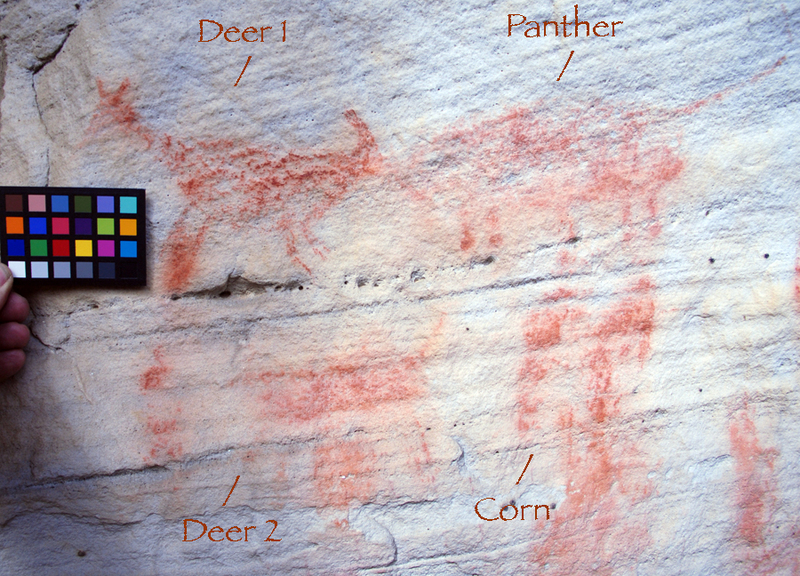 Pictograph of two puma (Puma concolor) hunting the deer. They are tracking a deer (to its immediately left) and have already wounded a second deer (to its lower left). The blood flowing from the wounded deer may be symbolic of rain. The panel may be an explanation for rain coming from sky spirit beings wounded by a puma spirit being. The foreground puma is small while the background puma is very large and this may represent a male/female hunting pair or an adult puma teaching its young to hunt. 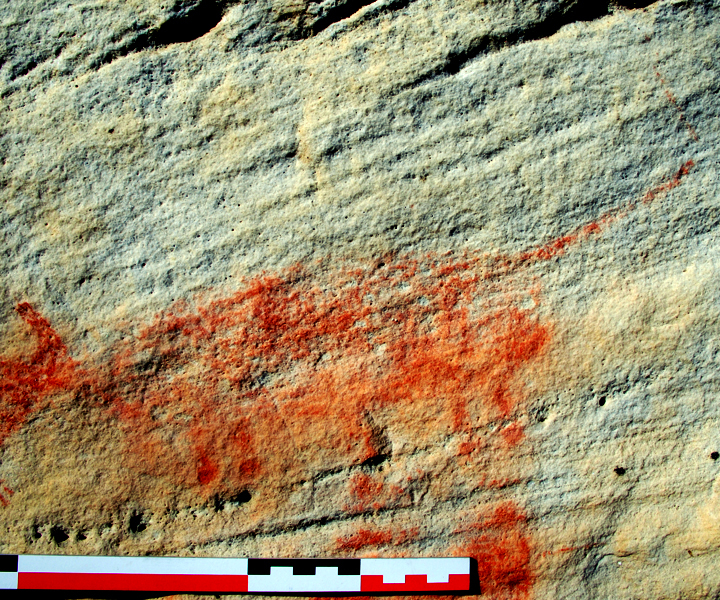 Several small pictographs along the left side of the 30 meter long pictograph panel. 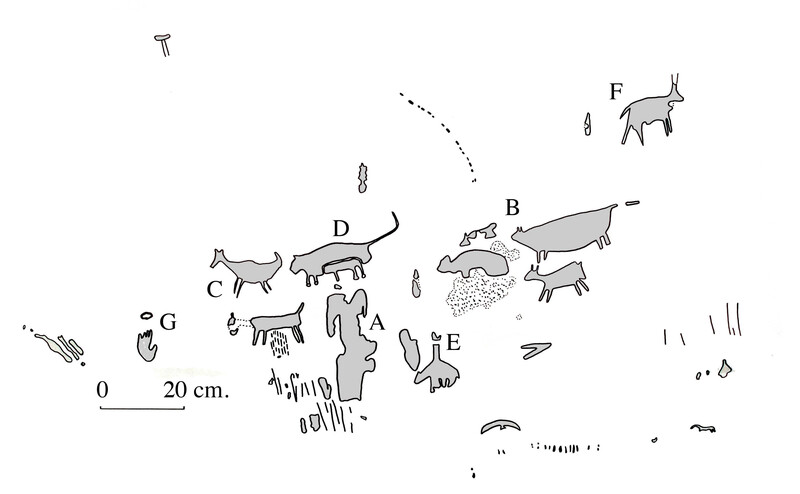 Pictograph panel that may represent several bison. The two bison on the right side are distinct while the two or three bison on the left side are smeared. Scale is 30 cm. in length. 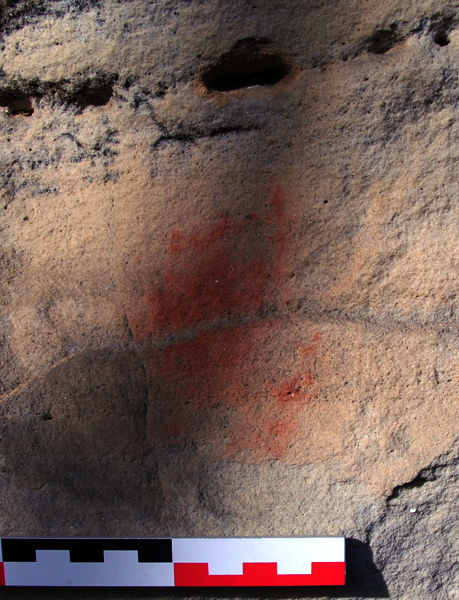 Pictograph with exaggerated color (high contrast and brightness) of a bear and its marked tree. Black bears claw, bite and rub against trees to mark their territory. 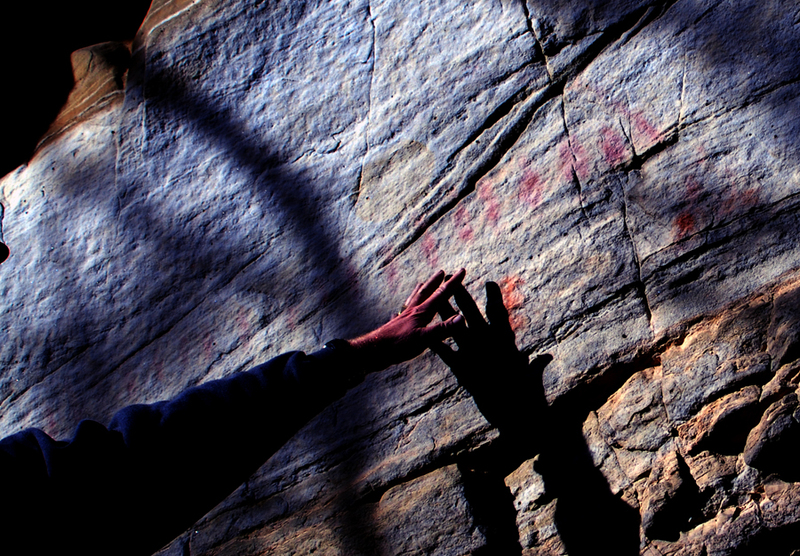 Human hand pictograph with exaggerated colors (high contrast and brightness). The fingers of the hand are partially missing. 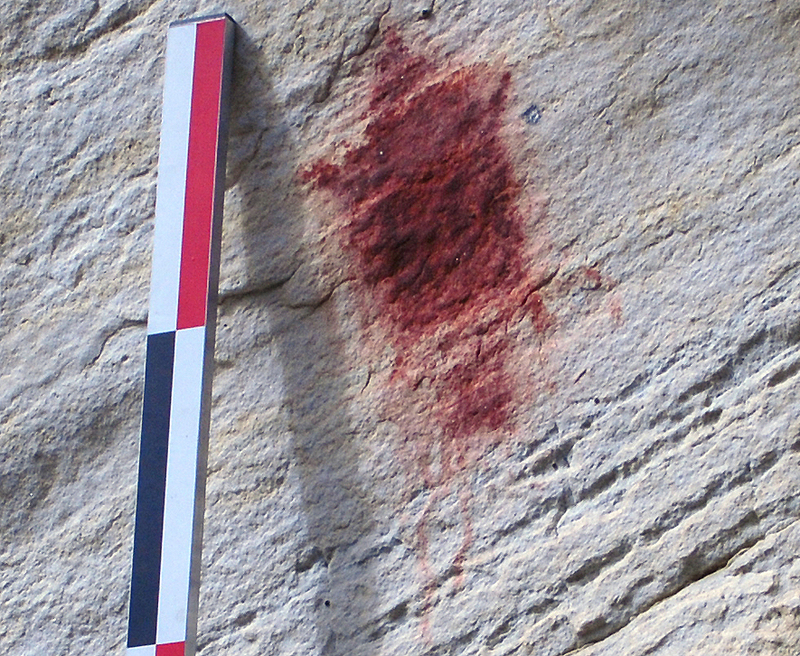 A natural cavity in the bedrock, directly above the hand, was outlined in red pigment. Scale is 10 cm. 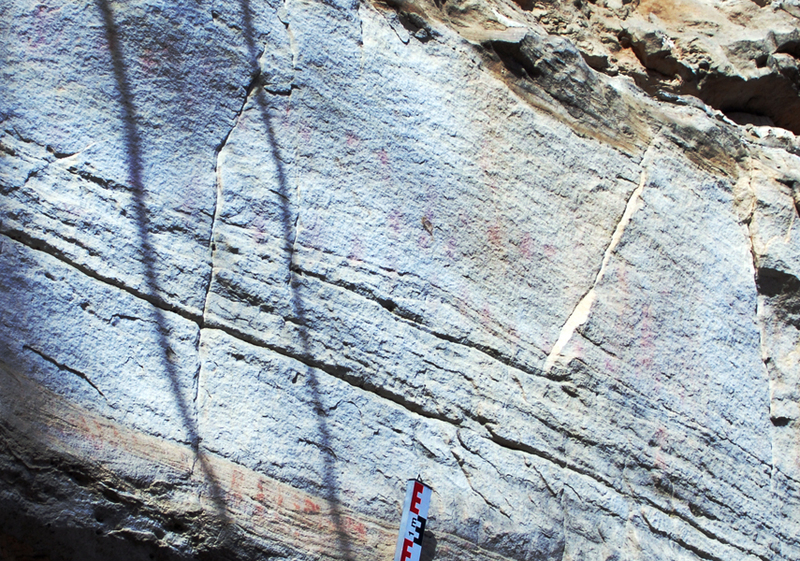 Faint vertical marks in the center of the pictograph panel are the oldest paintings at the site. 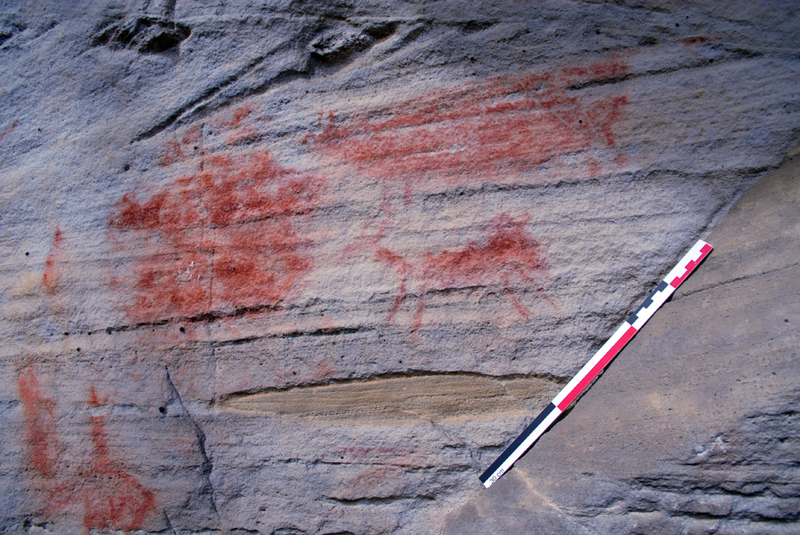 They are probably centuries older than the puma/deer panel or the turtle image. Color and contrast significantly exaggerated to make the panel visible. 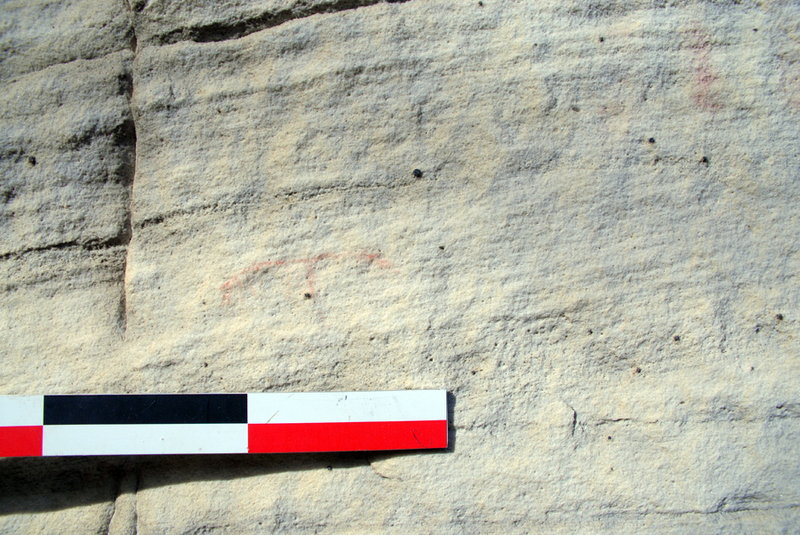 More faint pictographs near the center to right portion of the panel. They are hard to see even with exagerrated contrast. One portion of the panel may be a sunburst design or shield. Small pictograph that I saw as a thunderbird with an eroded head. Scale units in 10 cm. 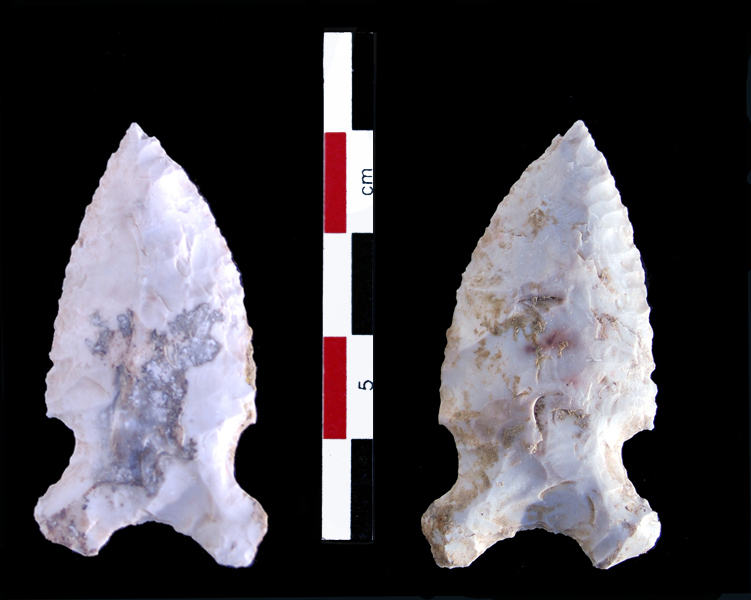 A resharpened side-notched projectile point was discovered in the loose soil left behind by a looter in Turtle Shelter. The artifact dates to the Archaic Period and would be many, many centuries older than the pictographs. The side-notched point measures 42.6 mm in length, 21.6 mm in width, and 7.1 mm in thickness. The basal concavity is 4.2 mm in depth and it weighs 6.4 grams. The two side-notches are 2.6 and 3.3 mm in depth. 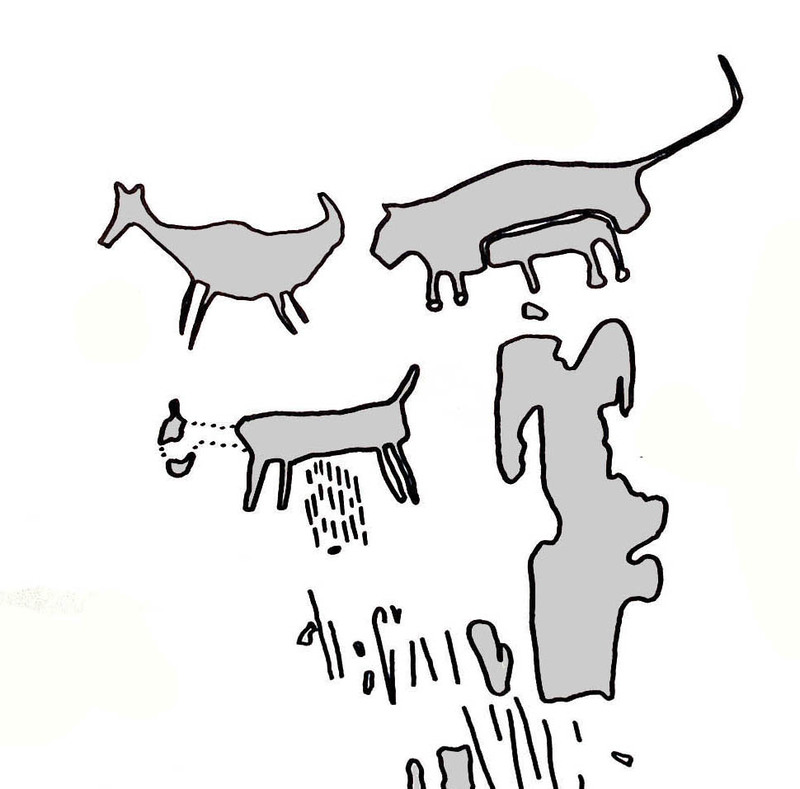 1993 The Petroglyphs and Pictographs of Missouri: A Distributional, Stylistic, Contextual, Functional and Temporal Analysis of the State's Rock Graphics Ph.D. Dissertation, Department of Anthropology, Washington University , St. Louis, Missouri.